Seems I’ve been experiencing a FUN kind of trouble here this AM, while preparing to send you the three BACK TO SCHOOL cartoons attached to this email — that is, "trouble" deciding which toons to include! The first one [“TUITION"] was a pretty easy pick, since it concerns the costs associated with shipping a teen off to college. 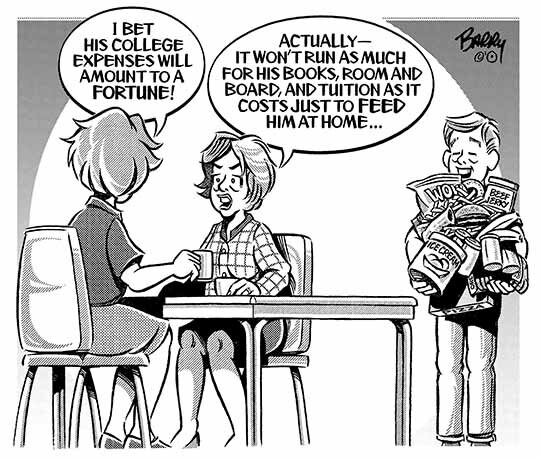 Surely, many parents out there are experiencing this about now — or will be in the near future. The second one ["CONDOLENCES"] wasn’t a tough choice either, really, since it contains most of the principal parties involved in getting younger kids back into the swing of the school thing — meaning: the Mom, the Kid & the School Bus Driver. Also, I like the empathy the toon shows for the Bus Driver, back-handed as it may be! 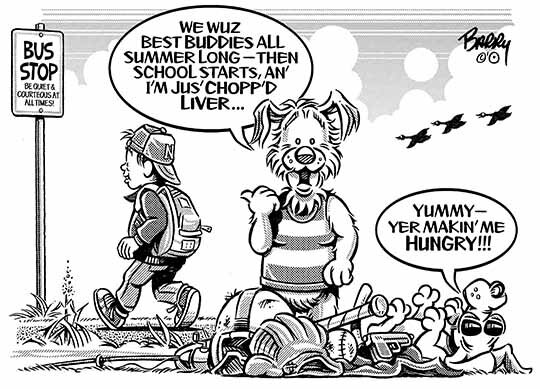 The third toon attached here ["BUDDIES"] was a personal pick, in that it features a couple of four-footeds & their respective takes on BACK TO SCHOOL — and you know how I love to draw animals, eh? HA! http://www.barryscartoons.com/a_BACKTOSCHOOL.html — where you’ll find 9 additional toons on the subject. If you czech out what’s offered in this online Category, I do believe you’ll see why I’ve had such a tough time choosing which toons to send — given the Category's variety of approaches to BACK TO SCHOOL! PLEEEEZ NOTE: If you’re experiencing a LESS-FUN type of trouble with my new email toon attachments, let me know right away, ‘kay?!!! When dealing with the massive sort of hardware & software changes that I’ve dealt with, there's bound to be a glitch or two in the works, eh? NEXT: Something for your annual FESTIVALS. Then LABOR/LABOUR DAY, then FOOTBALL — then .. then .. then … HA!